Pelmor's engineering department works closely with customers to create their finished parts, develop specifications, produce blueprints or drawings, and/or make prototype parts. We will work from the customer's blueprints and stringent specifications or create new ones. Our computer-aided machines create 2 and 3 dimensional drawings and 3 dimensional solids, and are coupled with many years of practical, hands-on, rubber parts engineering experience. We assist the customer in creating a new product or modifying and improving an existing one. Tolerances, shrinkage values, and dimensions are all determined to precise limits and allow us to make finished molded parts to within tolerances of +/- .002" and finished extruded parts to within tolerances of +/- .005". 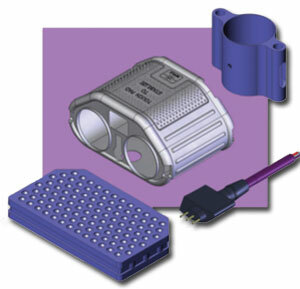 From this work, a prototype tool or die is created that will make the finished sample part to the customer's exact specifications. Once the prototype parts have been tested and approved by the customer, Pelmor's machine shop will make the production tool or die.